It was named after Claremont, the country mansion of Thomas Pelham-Holles, Earl of Clare. On October 26, 1764,[ Colonial Governor Benning Wentworth granted the township to Josiah Willard, Samuel Ashley and 67 others. Although first settled in 1762 by Moses Spafford and David Lynde, many of the proprietors arrived in 1767, with a large number from Farmington, Hebron and Colchester, Connecticut. The undulating surface of rich, gravelly loam made agriculture an early occupation. It was water power from the Sugar River, however, which brought the town prosperity during the Industrial Revolution. Large brick factories were built along the stream, including the Sunapee Mills, Monadnock Mills, Claremont Machine Works, Home Mills, Sanford & Rossiter, and Claremont Manufacturing Company. Principal products were cotton and woolen textiles, lathes and planers, as well as paper. 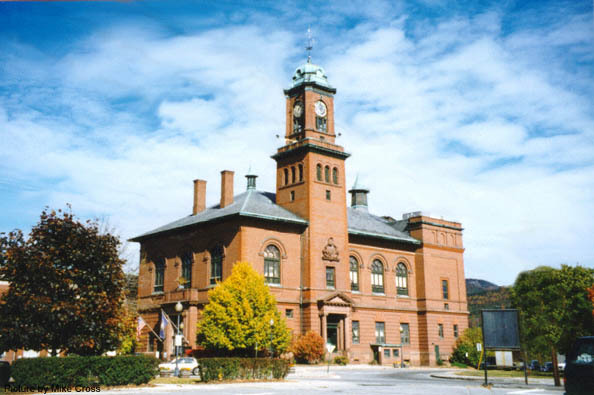 Although like other New England mill towns, much industry moved away or closed in the 20th-century, the city's former prosperity is evident in some fine Victorian architecture, including the 1897 city hall and opera house. for look - up assistance in the following books and periodicals, among other sources. Catholic Marriage Records of Claremont's St. Mary's & St. Joseph's 1873-1980. Written by Friar Fernand Croteau in 1980. In addition to the marriage dates, the parents of the bride and groom are also mentioned, and in some cases where they were from. Also Fr. Croteau lists a page full of name changes - for example: Benoit to Benware; Courchesne to Cushion, Dubois to Woods etc. Catholic Marriages of Sullivan County 1902-80. Similar to the above only it includes Catholic Marriages in Sullivan County (excluding Claremont.) Nonetheless, the book includes numerous Claremont residents who were married in nearby towns. Claremont War History, April 1861 to April 1865, by Otis F. R. Waite. Includes a biographical notice on each Claremont soldier with sketches of New Hampshire regiments. History of Claremont NH 1764-1894 by Otis F. R. Waite: A comprehensive history of the people and times, spanning 130 years from its first settlements. With Marriages, Births, and Deaths prior to 1797 and many Biographical sketches. Index of names has over 3000 individuals listed. Local Lookups: Mr. McElreavy is willing to do some genealogical look-up's for you and has access to many types of reference material relating to Marriages, Births, Deaths and Cemetery Inscriptions. Please be specific and limit your request to 1 or 2 surnames. If you have any reference material on Claremont and would like to volunteer to do lookup's, please contact Mr. McEleavry.